This adapter permits proper orientation and connection of the 4 Series Carpet Edge Sealing Tips on glue guns with 7/16"-20 internal threads. This adapter permits proper orientation and connection of the 4 Series Carpet Edge Sealing Tips on glue guns with 7/16"-20 internal threads. The Adapter has 7/16"-20 external threads which fasten into the glue gun, and also 3/8"-16 external threads on the other end onto which the 4 Series Tip is attached. 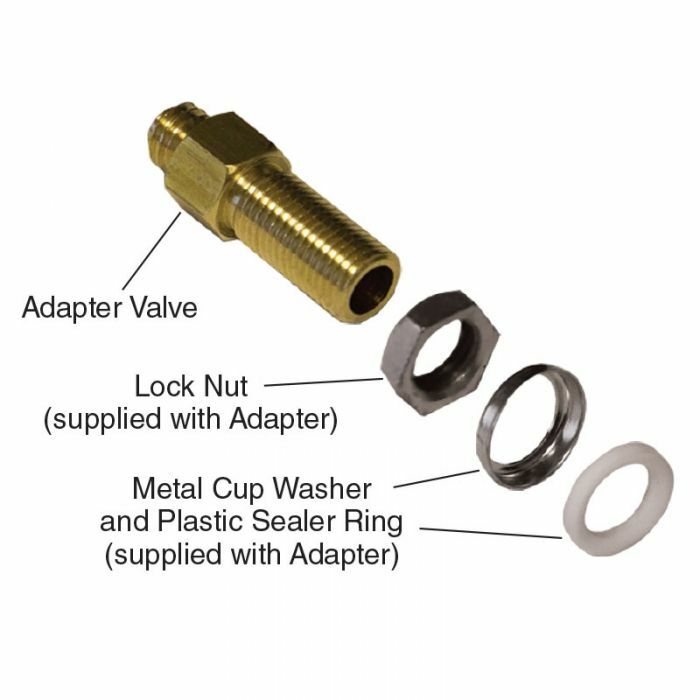 The O-Ring (or user supplied Teflon® tape on the 7/16"-20 threads) serves to prevent glue leakage, while the Lock Nut properly orients the 4 Series Tip. Included within the adapter body is a spring loaded ball-check valve to prevent glue flow after releasing the trigger. The adapter body is 1/2" diameter x 1-9/32" long.